Vermont and Mark were awesome. We told them our budget and the max we could afford. After about 30 min, Mark told us he did it and found a bank in our budget. Great experience and now new owners of the 2020 Telluride! I can depend on this dealership to keep my car in great condition. I purchased a used car this weekend and while I wouldn't say that buying a car is something I look forward to, dealing with Vermont (our salesman) made the task much easier!! Laid back, genuinely friendly and honest are words to describe him. He doesn't know the meaning of "pushy" and I would recommend he teach a cars sales course! Kudos to the dealership for having him and hope I have the same experience with the rest of the staff. Great place to have car serviced. 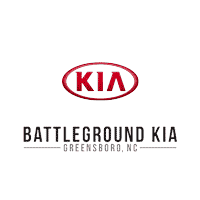 Battleground Kia have the best service every since I purchased my car in 2015. I'm never disappointed when I go there. Everyone is so friendly and helpful and fast. No longer waits. I was pleased with the service provided. This was my first service on my 2019 Optima. They changed my oil, rotated my tires, amd dis a computer update from a recall. The service was completed in a timely fashion despite them being busy from the minute they opened at 7am as I was their very first customer and they already had 4 cars that were dropped off at the gate!